In May, I returned from a very successful (and enjoyable!) research cruise in the central Pacific Ocean, aboard the University of Hawaii research vessel Kilo Moana. 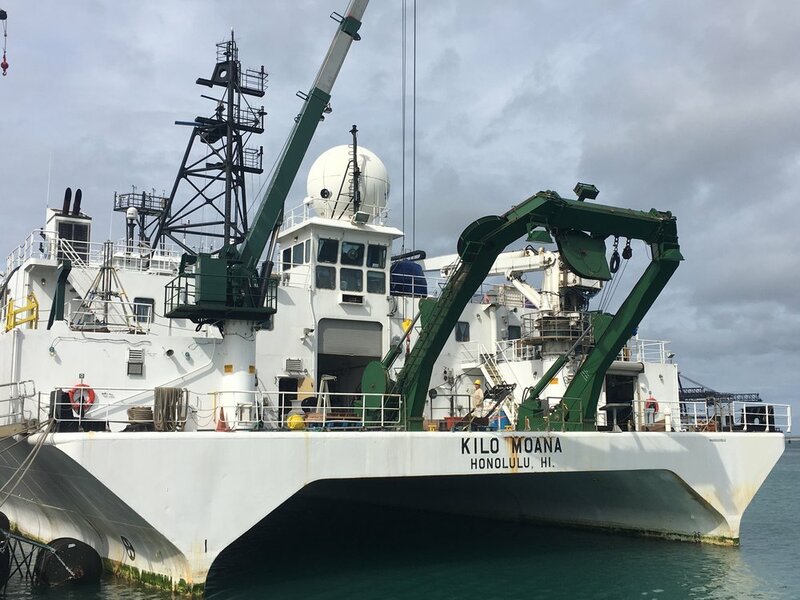 Along with co-chief scientist Jim Gaherty (LDEO Columbia University) and a diverse science team from 11 institutions (spanning 3 continents), I was deploying 30 broadband ocean bottom seismic instruments in a large array spanning 500x500 km of Pacific seafloor. 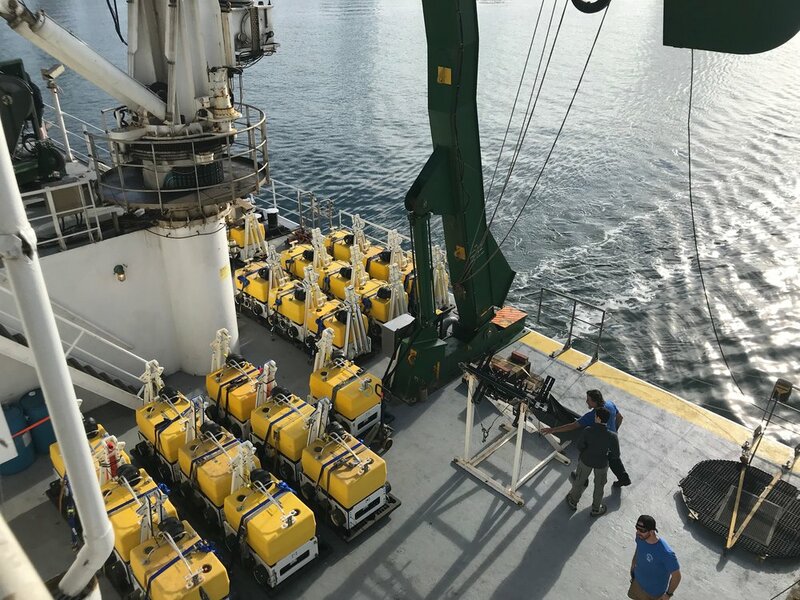 These instruments will now sit at the bottom of the ocean until July 2019, recording earthquakes around the world; the goal is to use the seismic data to make 3-D images of the Earth’s interior beneath the Pacific tectonic plate. The location was very remote; the ship was out of sight of land for all but a few hours of its 31 day voyage. As a result, the data we collected represent completely new observations of this part of our planet! 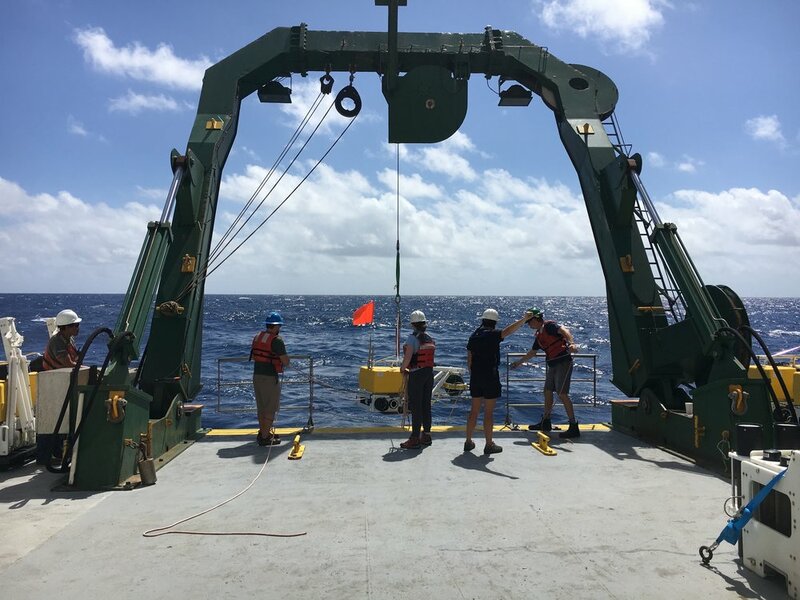 At the same time as deploying the seismic instruments, our research team conducted high resolution bathymetry surveys, discovering previously unknown seamount chains and wholesale changes in sea floor tectonic fabric. 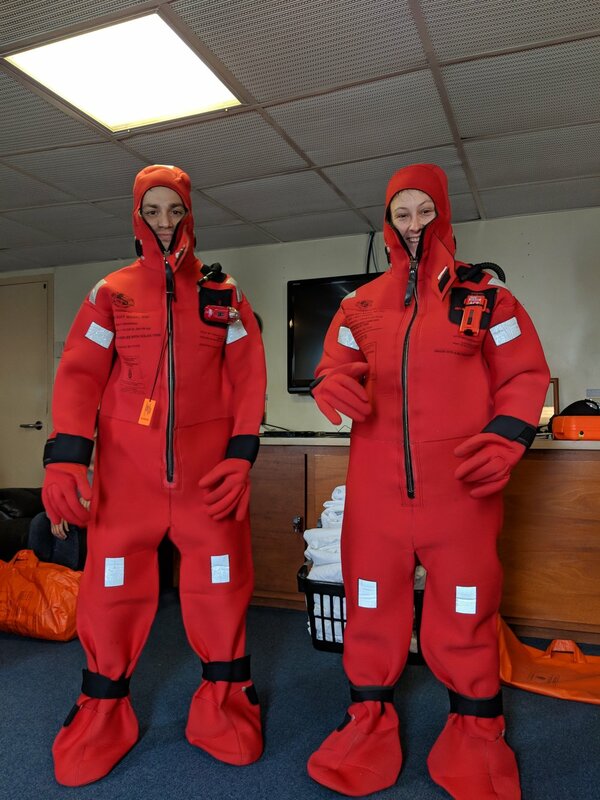 If you are interested in participating in future cruises, we have opportunities for graduate students and post-docs to sail on the upcoming recovery and array #2 deploy/recovery legs. The scientific results from this experiment will not be known until the instruments are recovered next year so for now enjoy some field photos (below), and stay tuned! Learn more and see more photos at the official cruise website/blog. Note: I am actively recruiting graduate student researchers to work on the data from this project (first data expected July 2019). See here if you are considering applying to join my research group. A nice news article about some high-profile research we just had published in Science Advances! It may sound obvious, but seismology transcends national borders. Of course, earthquakes, tsunamis, drinking aquifers etc. do not respect the artificial political boundaries we have thrown up. (There are a couple of instructive exceptions, such as injection-induced earthquakes in Oklahoma or Ohio being largely confined by state boundaries, which delineate regions where such injection is legal.) Moreover, the academic discipline of seismology itself is remarkably international. This has long been a characteristic of our field. One of the fathers of global seismology, Liverpudlian John Milne, is a case in point. Milne drew upon a career that spanned academic appointments across Eurasia. By the time he started a professorship in mining and geology at Tokyo’s Imperial College of Engineering, at age 26, he’d already got several field seasons under his belt in Canada and Africa. Joining other British and American ex-pat scientific luminaries in Japan, he founded the Seismological Society of Japan in 1880. Japan’s frequent and intense shaking presumably provided a literal kick up the backsides to spur on the international cadre of academics. Together, they invented the first horizontal pendulum seismograph, and a new era in seismic observations was born. As they dispersed, returning to their homelands, they took with them the skills and technologies that they’d developed in the melting pot of the Meiji academy. Milne returned to England and set up the first centre for global seismology in his back garden on the Isle of Wight. Milne leveraged his (and the British Empire’s) global network of contacts, receiving visits from foreign seismo-VIPs including Russian princes and famous explorers. He began to organise a coordinated network of international observatories: upon request scientists with (often home-built) seismographs would send (by snail/ship/horse+cart mail) paper records of global earthquakes to Milne’s home office. This coordination represented a paradigm shift for the geosciences. For the first time, scientists had simultaneous measurements of seismic activity from around the world. Suddenly, we could study processes at work across the planet. Milne compared and assimilated seismic readings, issuing regular bulletins that described the now-globally collected seismic data to an increasingly global audience. As Earth science research centres began to pop up around the world, these reports (which today bear the more grandiose moniker ‘Bulletin of the International Seismological Centre’) sustained the nascent science. All stations registered with the International Seismological Centre, with data reported to the international community. Today, I can sit at my desk and look at real-time feeds from seismometers distributed across the world, each one sensitive to the rippling of seismic waves smaller than a thousandth of a millimetre. 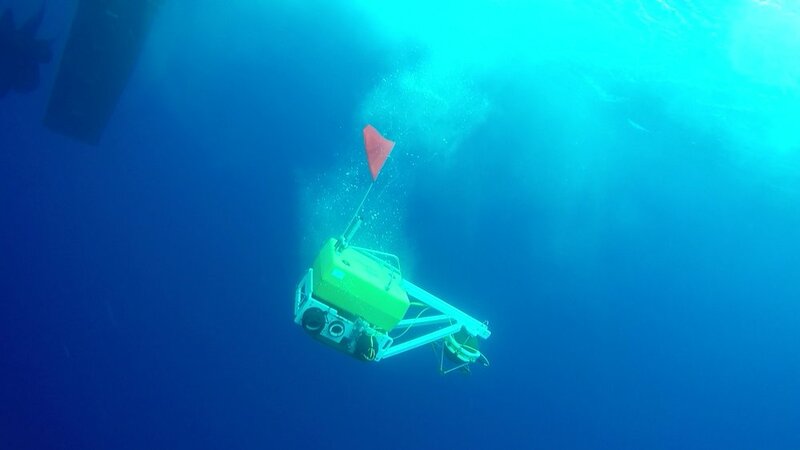 I can access archived data gathered by international teams working on every continent, in conditions from deserts to rainforests and from mountain tops to the deeps of the ocean. This assemblage of scientific enterprise is funded by governments rich and poor, united by a common understanding that we share this capricious planet and by a common drive to push the limits of our slowly receding ignorance. As students of the whole Earth, we require an aperture and longevity of observation that vastly outreaches any single country. In order to understand the possibility of a mega quake in Cascadia (the Pacific NW of the continental US) we can look to recent disasters in Japan, Sumatra, and Chile for guidance. In order to understand how the Atlantic ocean opened up as Pangea broke apart (with implications today for economic opportunities on the US eastern seaboard and hazards from seismicity to underwater landslides) we can learn volumes from studies of our sister coastline along the Iberian peninsula and western Africa. And then, of course, there is the near-limitless opportunity for improving our theories and techniques by harnessing the full ingenuity of the global Earth Science community. Perhaps more than any other scientific discipline, diversity is our greatest asset. With diversity of background comes a range of expertise across regions that run the gamut of Earth’s wondrous variety (to paraphrase that great line in Robin Hood: Prince of Thieves!). As residents of Istanbul and Los Angeles and Tehran and Yangon and Tokyo each await their own earthquake, they would do best to learn from each other’s history and each other’s planning. As citizens watch their land shrinking before the rising seas in Kiribati and the Netherlands and Bangladesh and Florida, they should recognise their joined fate and their imperative to work together towards global climate stabilisation. Milne and his contemporaries, a century and a half ago, understood that collaboration across borders and between institutions is key to a synoptic, global view into our planet. Today we live in a world unimaginably more interconnected than Milne’s. Global partnership holds exponentially more promise than ever before. The danger of siloing ourselves away has never held more peril. I just wrote a little package to do BREQ_FAST requests for data from the IRIS DMC all from within MATLAB. For you MATLAB-based seismologists, this has all of the nice workflow integration of irisFetch.m within your MATLAB command line, but the speed of bulk requests offered by BREQ_FAST. Example script for using the breq_fast request and processing tools. The contents of the trace structure that gets written out (only showing the first element of the structure: tr(1). tr(2) contains the same sort of thing, but for the HRV station - see script above. The waveforms plotted for the trace shown above.